Jorge Mario Bergoglio of Argentina was elected Pope Francis, The Holy See, on March 13, 2013, at the age of 76. He is the 266th pontiff of the Roman Catholic Church, the first Jesuit, the first to take the name Francis, as well as the first non-European leader of the church in more than 1,200 years. Outside of religious circles little was known about this former Archbishop of Buenos Aires and the stir he would cause with his new ways, including ditching the papal palace for his own small 2 bedroom apartment, using a Ford Focus instead of riding in a limo, sometimes paying his own hotel bill and showing off his funny bone at his first official dinner by saying: "May God forgive you for what you've done." But for those listening carefully during his conclave speech before the election, they might have caught his prescient words, when he said the Church, in order to survive, must stop "living within herself, of herself, for herself." Many Catholics I have spoken with have a renewed interest in checking out what positive changes this pope, who is seemingly more in touch with the real world, can create. Not only have papal event audiences experienced a 300% increase to 6.6 million in St. Peter's Square since his election but Pope Francis has also been at the centre of a media-frenzy for the past year. Who is this new kind of pope, who is this man of the people, one who is seemingly just as comfortable with the poor and downtrodden as he is with the leaders of the world? Who is this pope who is changing the time honored style of the papacy to fit his down-to-earth way of being. His friend, journalist Elisabetta Pique calls what Pope Francis is introducing in Rome: "a scandal of normality." 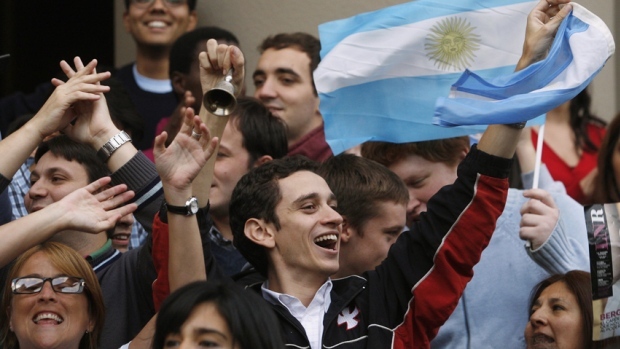 Most Argentinians are thrilled that their former Cardinal is now head of their church and feel he will make real changes that affect real peoples lives. Born to Italian immigrant parents on December 17, 1936 in Buenos Aires, Papa Francesco (as the faithful in Rome now call him) grew up surrounded by Italian relatives in a middle class section of Buenos Aires called Flores. He did some pretty normal things as a teenager, like being a bouncer in a bar, playing soccer and dancing the tango, this being Argentina. the home of tango. He studied to become a chemical technician before turning his eyes towards the priesthood. 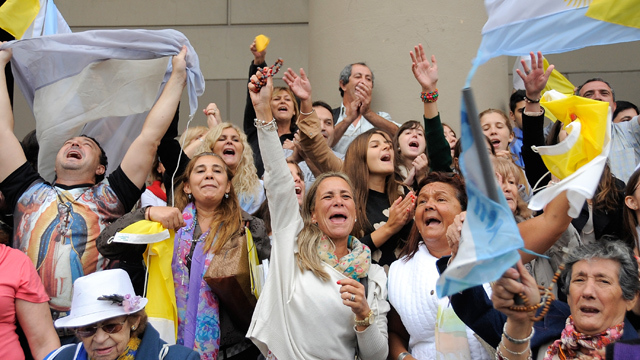 He was ordained a priest in 1969 and quickly rose in the ranks until becoming archbishop of Buenos Aires in 1998. From riding the bus, to kissing the feet of AIDS patients, to taking confessions from street prostitutes in the worst neighborhoods to marching with slum dwellers to opposing drug dealers, this man has always lived humbly and with compassion for all. It was not surprising that he became the Cardinal of Buenos Aires in 2001. His actions at that time also reflect the modest path he is on now with the church and its outreach. He asked the faithful not to come to Rome to celebrate his creation as Cardinal but rather to donate to the poor what they would have spent on the journey. 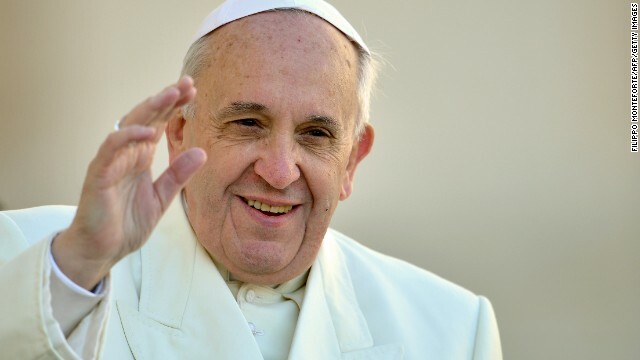 This pope "recently told a newspaper he has had enough of the hero worship that has accompanied his year long papacy. He also said: "Sigmund Freud used to say, if I'm not mistaken, that in every idealization there is an attack," he said. "Depicting the pope as a kind of superman, a kind of star, seems to me offensive. The pope is a man who laughs, cries, sleeps calmly and has friends like everyone else. A normal person." Today we also have to say "thou shalt not" to an economy of exclusion and inequality. Such an economy kills. How can it be that it is not a news item when an elderly homeless person dies of exposure, but it is news when the stock market loses two points? This is a case of exclusion. Can we continue to stand by when food is thrown away while people are starving? This is the case of inequality. Today everything comes under the laws of competition and the survival of the fittest, where the powerful feed upon the powerless. In this context, some people continue to defend trickle-down theories which assume that economic growth, encouraged by a free market, will inevitably succeed in bringing about greater justice and inclusiveness in the world. This opinion, which has never been confirmed by the facts, expresses a crude and naive trust in the goodness of those wielding economic power and in the sacralized workings of the prevailing economic system. Meanwhile, the excluded are still waiting. Since I am called to put into practice what I ask of others, I too must think about a conversion of the papacy. It is my duty, as the Bishop of Rome, to be open to suggestions which can help make the exercise of my ministry more faithful to the meaning which Jesus Christ wished to give it and to the present needs of evangelization. Our church doors should always be open, so that if someone, moved by the Spirit, comes there looking for God, he or she will not find a closed door. Beware of the temptation of jealousy! We are all in the same boat and headed to the same port! Let us ask for the grace to rejoice in the gifts of each, which belong to all. To pray for a person with whom I am irritated is a beautiful step forward in love, and an act of evangelization. Let us do it today! Let us not allow ourselves to be robbed of the ideal of fraternal love! However dark things are, goodness always re-emerges and spreads. Each day in our world beauty is born anew, it rises transformed through the storms of history. Values always tend to reappear under new guises, and human beings have arisen time after time from situations that seemed doomed. Such is the power of the resurrection, and all who evangelize are instruments of that power. Pope Francis is concerned with and working towards a greater transparency inside and outside of the Vatican enclave. He is pushing for a world that has more income equality, better human rights, social and environmental justice for all and for a world where forgiveness and peace are a reality. He is leading the Vatican into an era where it is more independent and truly a global player on the diplomatic stage. Towards that end he recently hosted an historic prayer summit in the Vatican gardens with both the presidents of Israel and the Palestinian Authority. 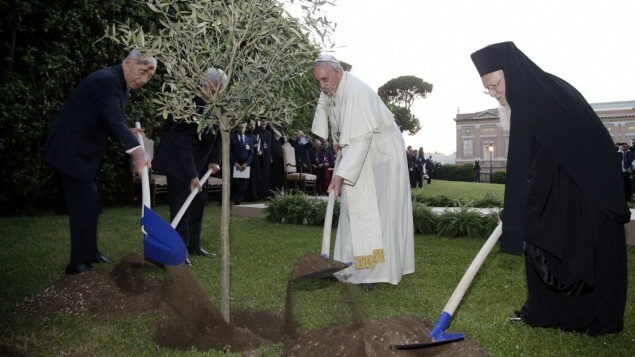 Planting for peace in the Vatican gardens: Not so long ago this image of Israeli President Shimon Peres and Palestinian President Mahmoud Abbas praying with Pope Francis would have seemed unattainable. But on June 9, 2014 after jovialities and hugs, the three attended a sunset invocation of Jewish, Christian and Muslim worship. "The pope spoke after Jewish rabbis, Christian cardinals and Muslim Imams read and chanted from the Old Testament, the New Testament and the Koran in Italian, English, Hebrew and Arabic in the first such inter-religious event in the Vatican. In the words of John Lennon, this Pope is well on his way to "Give Peace A Chance." There is no telling what this visionary will accomplish. Hero or not. he is loved and adored and the whole world is watching. The Holy See Francis - The Vatican website about Pope Francis, THE HOLY SEE of the Catholic Church.